Due to recent events, patriotism has risen in America more than ever. Despite the new threats and orange alerts we experience, we take great pride to be a part of this multi faceted nation. Many individuals have risen to the occasion and demonstrated exceptional commitment and dedication to our country and our ideals. People contribute to their community on many different levels. Many show their patriotism by doing notable deeds through volunteering, fund raising, donations, or service. 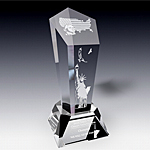 At Crystal Art USA we created a collection of patriotic crystal awards that commemorate exceptional individuals who dedicate their time and efforts to better our society. 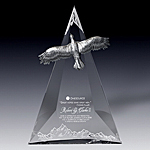 Soaring Eagle awards symbolizes freedom and courage – the cornerstones of American society. Soaring high our eagle series represent majestic but graceful strength. Individuals who truly strive to be the best well deserve our eagle awards. 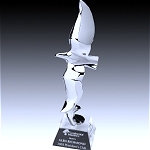 The Eagle Fly Free trophy from the series was awarded 2nd place Most Creative at the ARA Award Show in Vegas in 2002 and has been one of bestsellers. 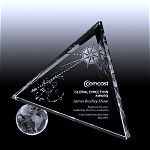 Engraving of logo and personal text message is available on the base of the award. 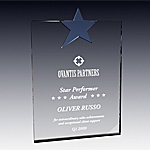 Shining individuals with their achievements and kind acts were kept in mind when designing our star trophies. No words are needed to explain the star series. To accentuate the brilliance of star, chrome stars were used in our new pieces. 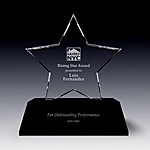 Our Star trophies have been celebrating many shining individuals. American Shield award features a globe with a picture of North America on the shield, that is supported by American flag. 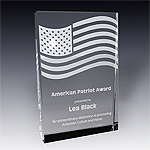 This crystal award epitomizes patriotism and dedication to our country. The shield award is ideal for men and women who serve in the military, defense industry, federal organizations and law enforcement. The American Justice award pays tribute to all just and fair. 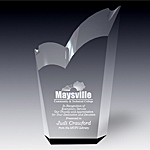 The justice award is presented to people dedicated to law enforcement and the judicial system. 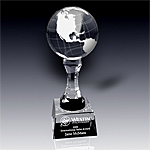 Expressing appreciation to deserving individuals for their worldly deeds and achievements, our globe awards are perfect. 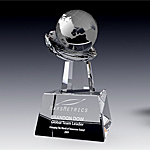 Our globe awards will surely show giver&apos;s gratitude towards the receiver.